Hinds County Sheriff Victor Mason (left) and Supervisor Peggy Calhoun (right) discuss the importance of mental-health services and diversion programs for Hinds County residents entering the criminal-justice system. Photo by Imani Khayyam. JACKSON  Locking up people suffering from mental illnesses is an endless, fruitless cycle—unless a person can access the services and (in some cases) treatment needed to live their lives in the most integrated setting possible. But most Mississippi law-enforcement agencies and courts have no diversion programs available to allow judges to sentence someone to a rehabilitative program instead of sending them to prison or jail. They never had them in the first place, or state budget cuts to the Department of Mental Health have eliminated the ones that were there. The Hinds County Sheriff's Department has been under a consent decree to address dangerous conditions in its jail since the U.S. Department of Justice wrote a 29-page findings letter in 2015, after investigating the Hinds County Adult Detention Center. They found that the county violated the 8th and 14th amendments, by "failing to provide conditions of confinement that offer prisoners reasonable safety and protection from violence ... and holding prisoners in the jail beyond their court-ordered release dates." The letter pointed to increasing violence in the jail from 2012 to 2015 including "at least three major riots, two alleged homicides and numerous assaults on prisoners and staff members." Hinds County Board Attorney Pieter Teeuwissen said the board decided to negotiate instead of spending years in fruitless litigation. "In that consent decree, we negotiated provisions for mental-health diversion and mental health services—we have done something that hasn't been done elsewhere in the country," Teeuwissen said at a Criminal Justice and Mental Health Forum at Jackson State University on April 20. Hinds County Sheriff Victor Mason said the first step is re-training all his officers. He told the forum that officers are not trained to handle mental-health cases and that training will continue for the rest of the year. "I don't have padded cells; I have concrete and bars, and I have to re-adjust my jailers who have been trained to defend themselves to now more or less be ushers in church," Mason said at the forum. Until 2016, Mason and other Mississippi sheriffs used the 29-bed acute medical psychiatric service at Mississippi State Hospital administered by the Department of Mental Health as their diversion program, as well as other units that served men in chemical dependency units at East Mississippi State Hospital. The Department of Mental Health closed several programs for chemical-dependency after the 2016 legislative session and subsequent budget cuts, however. Mason said the solution is to re-open that program, but that is unlikely to happen after the massive cut the agency took this year. Up to 650 employees will lose jobs by June 2018, a statement from DMH says. The U.S. Department of Justice sued the State of Mississippi in 2016 for over-reliance on institutionalization, keeping adult Mississippians in in-patient, overnight and long-term facilities. Instead, the DOJ wants to see the state fund community-based services, which all recent and evidence-based research support as a means to appropriately treat most mental illnesses. The DMH budget bill requires the agency to keep funding community-based services. Tameka Tobias-Smith, the Mississippi executive director of the National Alliance on Mental Illness, says her group advocated for mental-health courts in the 2017 legislative session—and succeeded in part. Lawmakers amended the Rivers McGraw Act—initially a bill to protect minors from overdosing, getting caught and bailed out—without telling their guardians, to initiate pilot programs for mental-health courts in six judicial districts statewide. Still, the new law contains no funding mechanism, so courts must pursue grants and funds to start programs. Judges in districts not listed in the law, like in Hinds County, have worked on starting their own mental-health courts, and a municipal court in Hattiesburg has one already in place. Ideally, the mental-health-court program would divert those who commit low-level crimes and suffer from mental-health issues away from jail or prison and into a system of care where they get needed support. Mississippi needs to establish access to local support groups and services at local community mental-health centers to avoid a drawn-out court battle with the DOJ. Tobias-Smith said community-based care also includes the efforts of local churches and organizations to provide services to those that need it. "We push for community-based care because we want that person with a mental illness to know that we're here to support you, not isolate," she told the Jackson Free Press. "Isolation is not helpful because you want them to be included." From a Hinds County perspective, the State has the responsibility to fix the system of care and fund programs. Hinds County Supervisor Peggy Calhoun said at the JSU forum that legislators need to recognize that counties need financial support and cannot do it alone. "The situation is going to get worse. It's going to spiral out of control because if a mentally ill person does not get the treatment that he or she needs, that person is going to get worse," Calhoun said on April 20. Teeuwissen echoed Calhoun, saying that circuit courts are actually the State's responsibility, and it should fund mental-health courts. "The approach cannot continue to be local funds," he said. 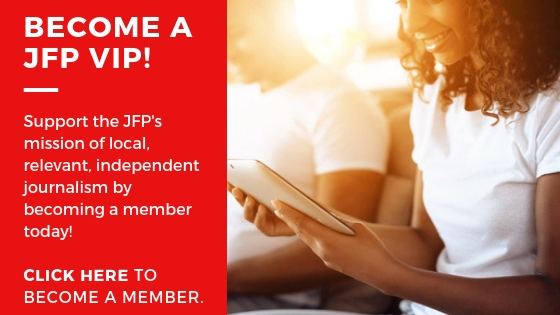 Read the JFP's ongoing "Preventing Violence" series at jfp.ms/preventingviolence.